The SMA Data Manager M optimizes communication, monitoring and control of PV systems. The Data Manager M replaces the SMA Cluster Controller, and with its new ennexOS software platform based on the „Internet of Things“ for energy management, is both easily expandable and well equipped to handle new business models of the energy market future. With intuitive assistance functions for the Data Manager M and inverter, time on-site for commissioning is significantly reduced. And with the new ennexOS platform, it is possible to change system and inverter parameters via Sunny Portal avoiding further time on-site. 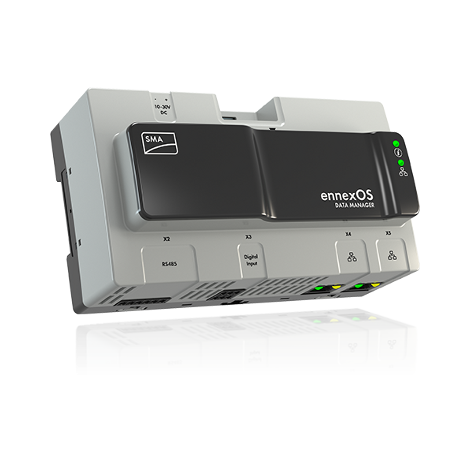 With its impressive and efficient user interface powered by ennexOS, the Data Manager M is the ideal platform and professional system interface for power supply companies, direct marketers, service technicians and PV system operators.